In Koester's take on this section of Revelation, we see that Satan pursues the church, attempting to overtake Christ and end his rule. Satan believed that he had succeeded in his attempt, in the crucifixion. However, after the resurrection, instead of remaining on earth, Jesus is caught up into heaven and demonstrates that Satan has been defeated in his rising. This is what we see in verses 7 and following; after a war in heaven, the dragon is defeated and is now confined to the earth. He is restricted from again entering heaven. Because of this, Satan is flailing; he knows that he is defeated, and like a beaten animal in an enclosed space, he lashes out in "great wrath, because he knows that his time is short!" 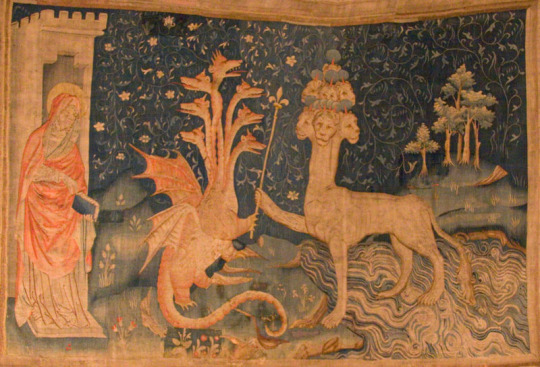 (12:12) After this, the dragon tries repeatedly to make war on the church, yet is repeatedly foiled in its attempts. Satan stands on the shore of the sea "as if to conjure up a new and terrible specter of evil." 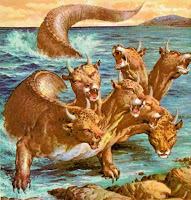 Satan, as well as his two minions - the beast of the sea and the beast from the land - form a new sort of "Unholy Trinity." The beast of the sea wears ten crowns - emphasizing its desire for renown and power. Revelation presents this beast as something of an evil counterpart to the Lamb. Whereas the Lamb's suffering brings glory to God, the first Beast's apparent suffering brings worship to Satan. The beast is an amalgamation "of oppressive powers from various times and places, creating a composite picture of evil." While the beast of the sea brings worshippers to Satan, the Beast of the land serves as a false prophet. If the people of the world will not identify with this servant of Satan, then they will face economic pressures (13:17). It would be easy to simply say that Koester takes the typical Preterist approach and names Nero as the Beast from the land right away. However, Koester sees the beast of the Land as something larger and more epically far-reaching than simply one individual who functions in a single moment. He says that this is part of the reason why so many throughout history seem to "fit the bill" of the Beast; because while John does link the Beast with a single individual, the Beast also represents leadership which demands worship over and above that which God deserves. This is a common and persistent enemy of the Church throughout all eras of history. This calls for wisdom: let the one who has understanding calculate the number of the beast, for it is the number of a man, and his number is 666 (13:18). A couple of observations. 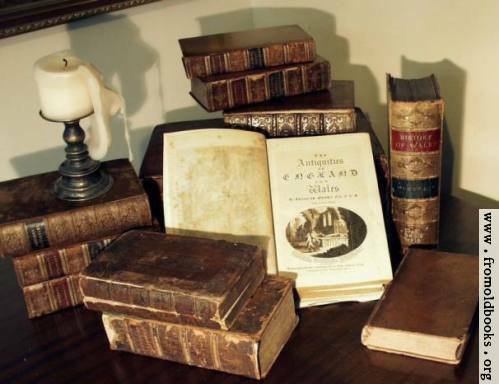 First, John believes that his readers in the churches - if they have wisdom - will be able to identify the Beast. 666 "is the number of a man." A historical figure. A literal person whom first century readers would have known. Nero ruthlessly persecuted Christians of John's time, "making war on the saints" (13:7). 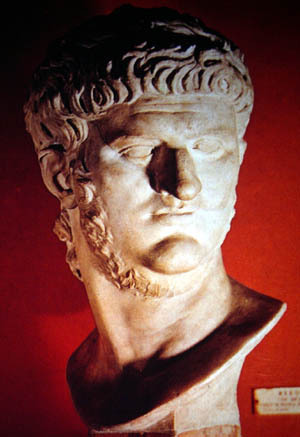 Nero killed himself by slitting his own throat, though, like Elvis, rumors persisted that he was still alive (13:3, 12, 14). Koester points out that deducing the identity of the Beast merely by way of gematria is insufficient, since it is possible to spell out many names which add up to 666. For example, if simply adding up 666 were sufficient, one would discover that Barney the "Cute Purple Dinosaur", "Ronald Raegan" or "Computer" were the Beast. Rather, he says that gematria is only one piece of the puzzle. If you already knew somebody's name, you could easily see if their name matched a given number. Nevertheless, he does substantiate the claim that Nero matches up with 666, and in his demonstration he does not disappoint. The gematriatic method of communication has a historical basis. For example, in Pompeii a man proclaimed his love for a girl in graffiti by writing, "I love her whose number is 545." This was a known method of communication. 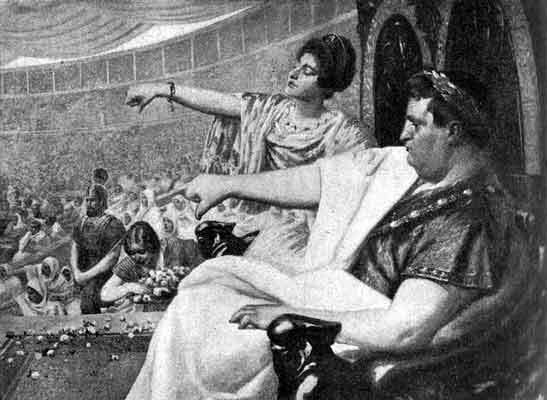 In many respects, Nero did, in fact, fit the bill for the Beast. When written in Hebrew, "Caesar Neron" transiterates as "nron qsr." One interesting textual variant found in some manuscripts lists the Beast's number as being 616. This is exactly what the name "Caesar Neron" adds up to if you dropped the second "n" from "Neron" and simply transliterated his name as "Nero." This variant is tremendously insightful as to what the earliest scribes understood to be happening here in this section of the text. It shows that the earliest textual scribes understood Nero to be the Beast. This is as far as my own demonstration goes, since I know next to nothing about Hebrew or gematria. Even though I was public schooled, I do know enough about math to know that those numbers do equal 666 when added together. In his conclusion of this section, Koester seems to appreciate other historical interpretations. 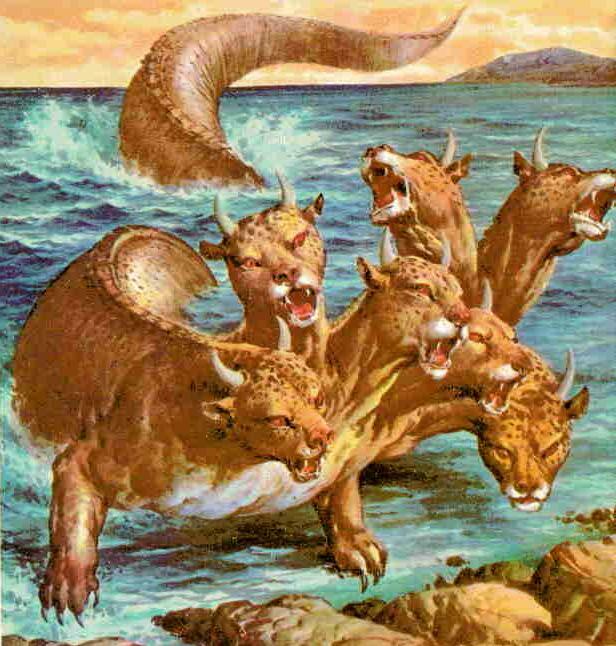 For example, some identify the beast of the sea as Rome, with the beast of the land standing for "the local Asian supporters of Rome." He says, however, that the difficulty of identifying a single historical figure to identify with these enemies of the Lamb is not a problem. Rather, it shows that the imagery depicts threats that cannot be limited to a single time and place. On the one hand, the portrayal of the two beasts does not convey coded information that will allow readers to know when the end of time has come. On the other hand, the visions may have called first-century readers to resist Roman practices...The summons to persevere is not simply a message for a generation living in the first century or at the end of time; it is a message for all generations that are confronted with idolatry and violence.